B ones and Joints Are the Chief Complaint of the Elderly and can cause problems. In the aging process, the key areas of complaint are the bones and joints. Research reveals that the deterioration and inflammation of these areas create; soreness, stiffness, swelling, achiness, and pain. All of these symptoms, especially the pain of a dull to sharp intensity are signs of problems in the body. On a day to day basis, these symptoms may vary, show up in other areas of the body and can get better or worse in the individual. Arthritis and injuries can cause problems which may not manifest in the body until later in life. While the skeleton provides support and structure to the body; the joints are the points where bones come together to provide flexibility for movement. Bones serve to protect organs, anchor muscles and store calcium for its usage. Muscles provide the power and strength to move body parts. Aging does present changes in the muscles, bones, and joints; consistently causing a breakdown and renewal, which over time will gradually slow down the renewal process. In a joint, bones are cushioned by cartilage and fluid which prevent the rubbing together of these parts. The deterioration of cartilage and fluid.... you guessed it, it creates the previously mentioned problems and pain. Calcium and several other minerals are lost which impact posture, walking gait and balance of the person. This launches muscle weakness, the joints become stiffer and less flexible and bones become more brittle and thinner. Together they cause limited mobility as well as slowness of movement. Women are more likely to experience these problems earlier than men because of the reduction or loss of estrogen and an increase in thyroid hormones. Men eventually experience the same due to low levels of testosterone. The elderly experience these changes in varying degrees; depending upon how active they are and the type of diet they adhere to. Exercise is one of the best ways to slow down the progressive deterioration of muscles, bones, and joints. It helps to maintain balance, flexibility, strength, and endurance. Walking, yoga, Tai Chi, tennis, stair climbing, strength training and rowing help to achieve the tone needed for a healthy body. Calcium from foods or supplements should be taken in on a daily basis. Calcium can be found in dairy products (milk, cheese, and yogurt), green veggies (kale, broccoli) beans, fish, and soy products. Vitamin D can be obtained from the sun and stored in the body, but to get it from foods try fortified vitamin D milk, eggs, oily fish such as salmon, mackerel, liver, and fish liver oil. Alcohol/Tobacco usage should be limited because research shows that both lead to bone weakness if indulged in on a daily basis. The unfortunate truth is that in our youth we often feel and think we will be young for quite a while. We often fail to consider the impact our lifestyle will have on our bodies’ bones and joints. We have come to understand that some of the reckless behavior of our youth (not taking proper care of injuries, engaging in activities without proper equipment for protection; maintaining unhealthy diets and failing to consult with your doctor when warranted). While your body is a well-designed machine, it has to be cared for and maintained before the aging process sets in to create physical problems. Now that we have come to that senior point in our lives it is vitally important that we pay attention to the changes in our bodies and adjust our activities accordingly. We don’t heal as we did at one time; therefore prevention is important in controlling mishaps and accidents. Falls are a major risk factor for the aged. Our diet becomes central to our well-being no matter what your state of health may be. Some of the foods you ate earlier in life you may have to minimize or eliminate them from your diet altogether. You can no longer eat all the butter, gravy, sweets, and fast foods you once ate on a daily basis, several times a day. You now should be making healthier choices which will allow your body to function without your heart having to go into overdrive, skyrocket your cholesterol, triglycerides, gout or some other malady. So what if I do you say...? All of these factors also impact the bones and joints of your body by not giving them the nutrients they need to preserve them. Worse even is the weight gain which occurs and comes to bear on those same bones and joints. Remember you are what you eat! Whatever takes place, keep a positive attitude and laugh a little. 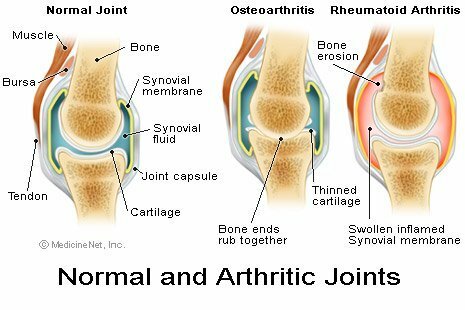 Another common culprit of the bones and joints is osteoarthritis. It is a degenerative and progressive condition; the normal fluids are replaced with inflammatory fluids which causes more intense stiffness, swelling, and pain. Depending upon how severe your case is you should consult your primary doctor or an orthopedic doctor. In most cases, symptoms can be minimized or corrected through a combination of exercise, weight control, and medication. Should your case be severe the only resolution would be surgery since there is no cure for this condition?